The first time I had heard about the sous-vide method of cooking was when Caspar from Yumi and now Deco joined us for a nyam about a year ago. He had just purchased the equipment and was already talking about tinkering with the method in an effort to perfect a sous-vide burger. Needless to say, Vinh and I were really excited. Caspar’s sous-vide burger has finally arrived on the menu at Deco. Not an everyday burger, coming it at $9 for the burger and triple cooked chips, it is however, probably the new king of burgers in Phnom Penh. Cooked evenly through with the sous-vide method done right, the meat is juicy and delicious. I think they even try to show off the quality of the burger meat by keeping the toppings relatively simple. The triple cooked chips fine but were not my favorite mostly because they are English style chips, not the American fries I’m looking for with a burger. 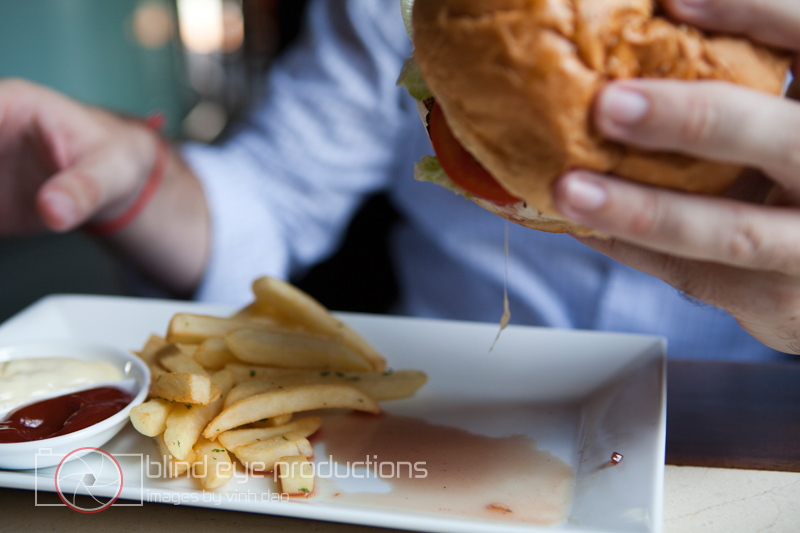 But the ketchup and burger sauce that came along with the plate were both awesome. For those of you not in Cambodia, ketchup being good is unfortunately not a given. It is typically some gross, sweet watery mess so Heinz 57 is a treat. The rest of the menu looks really good as well but I’m going to have a hard time not ordering the burger next time I’m back at Deco. On a normal night, Garage has one of my favorite burgers in Phnom Penh. Nothing fancy, just a solid backyard bbq style burger. It does take as long as 45 minutes to get one if their grill isn’t fired up when you arrive but they do the regular burger really well. 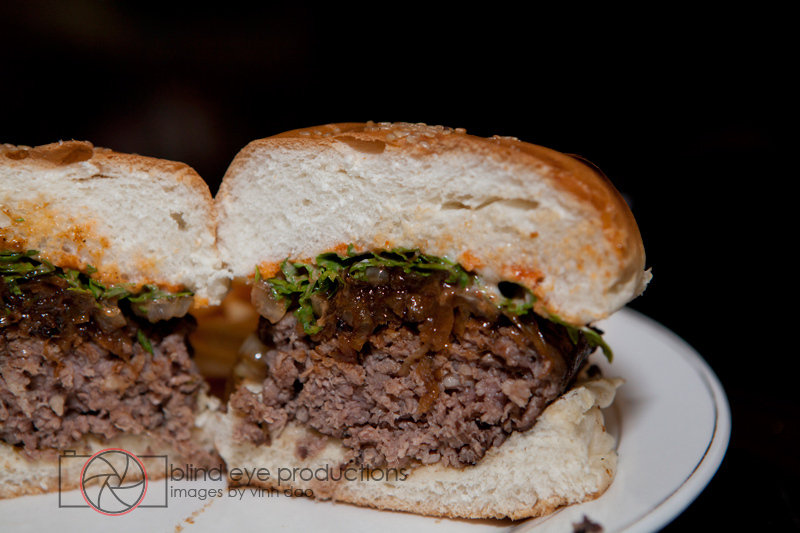 However, comparing the sous-vide burger from Garage to the Deco sous-vide burger isn’t even fair. At least not at this point. While Caspar spent a year trying to perfect his sous-vide method, I’m pretty sure the Garage owners bought one and are using their customers to learn how to use the equipment. 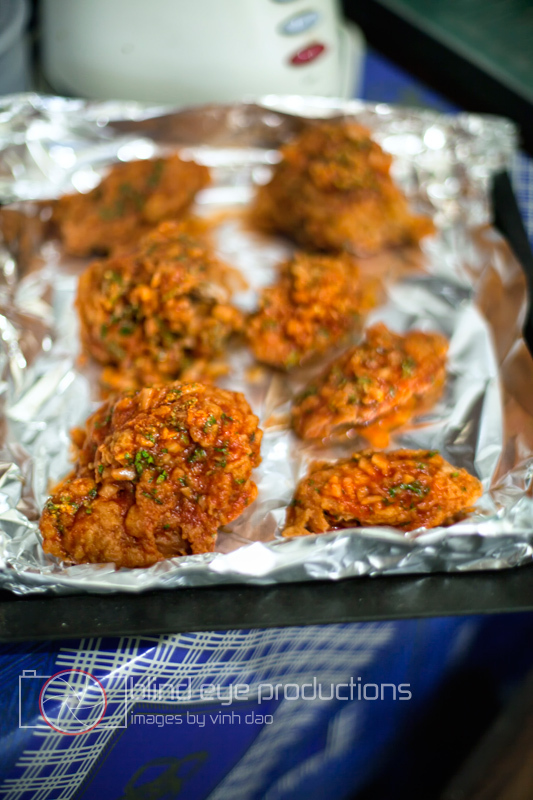 The night we gave Garage a shot, the burgers were extremely dry and crumpling apart as we tried to eat them. 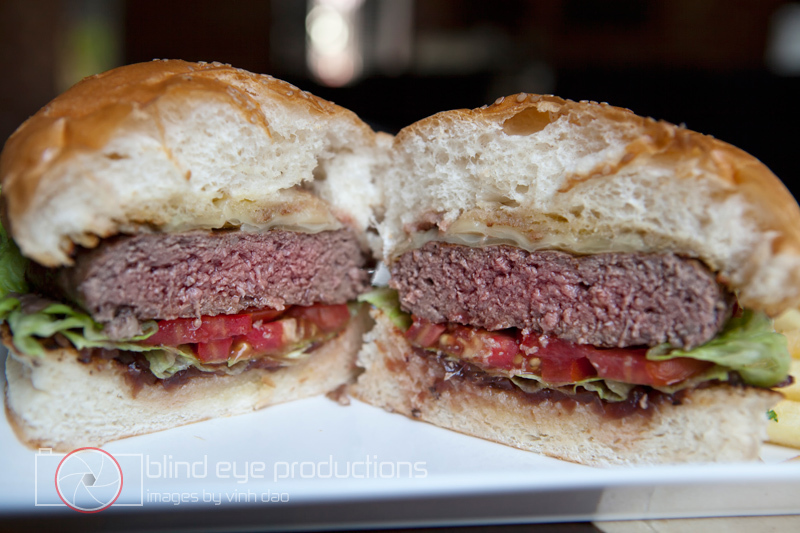 Apparently the whole idea behind sous-vide is to make a juicier burger; this was not the case. I’d stick to the regular burgers at Garage until they get this new style figured out. 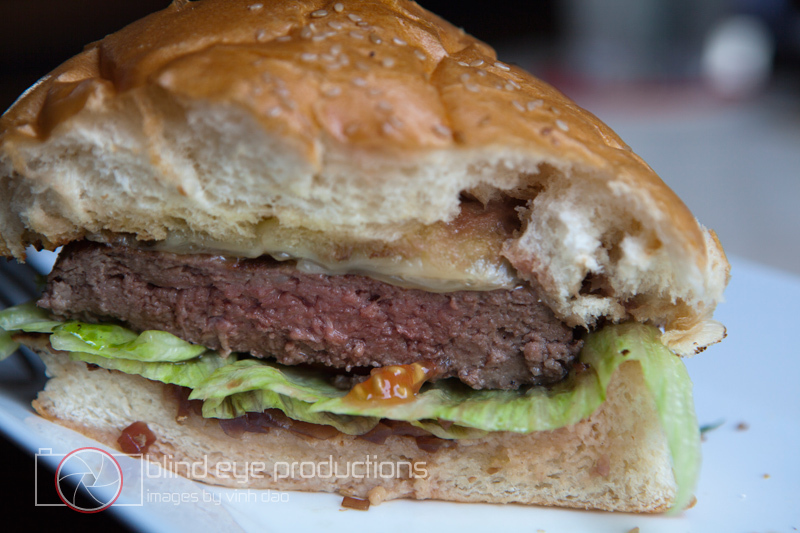 Our first post on this blog focused on a very American diner burger at Mike’s Burger House. 2 years down the line, the culinary landscape has significantly changed with new and exciting restaurants popping up left and right. Sometimes, they are a hit with us and other times, a bit of a miss. So when I wasn’t too surprised to hear that Phnom Penh has a joint that does sous-vide burgers. I was surprised when I found out that there are two! 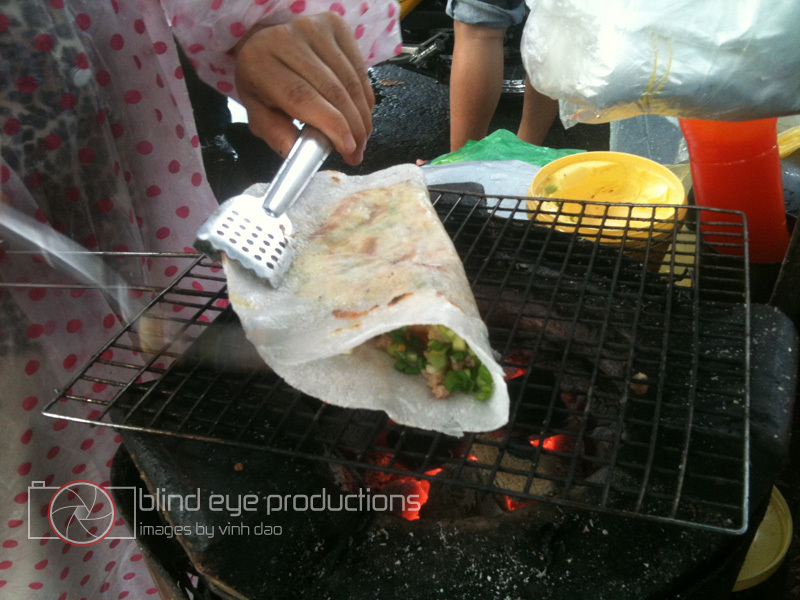 However, there are some downfalls to the cooking technique. Because it slowly brings the internal temperature of the food up, cooking times are significantly longer than traditional methods. Also; and this is very important for burgers; there is no browning of the meat. 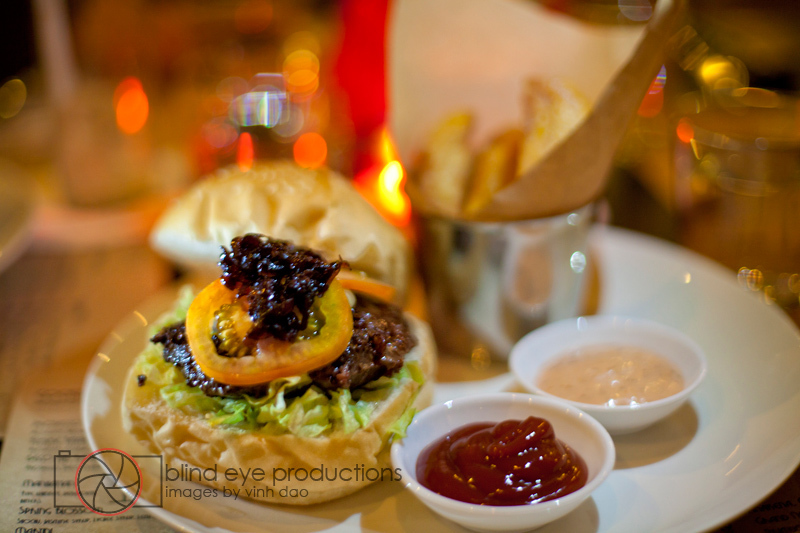 A big part of the burger experience is that char or “crust” that is prevalent on flame-grilled or griddle cooked patties which gives a textural one-two punch when biting into a burger. Okay, enough burger knowledge for one post, let’s get to the burgers! We first went to Garage to check out their sous-vide burger. 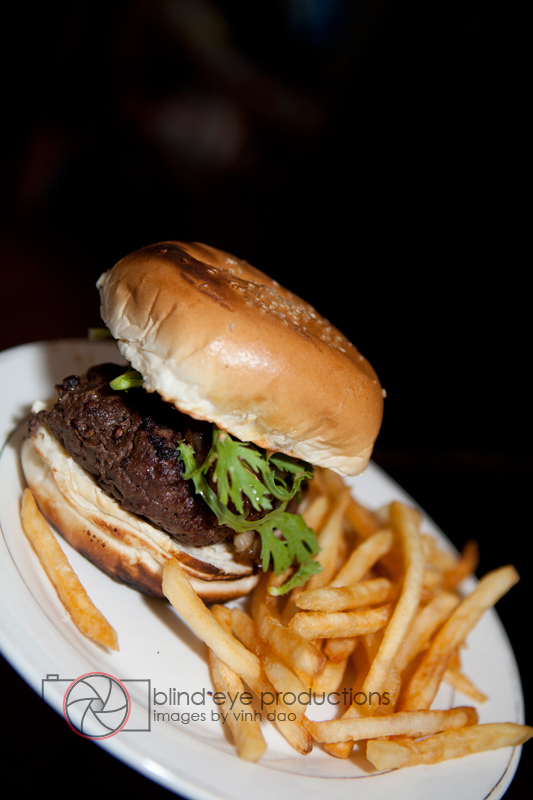 We are big fans of the Garage burger and Jeff the owner is always tinkering with the menu. Usually this is a bad omen of things to come in a restaurant, but in this case, it’s great to see someone constantly refining the menu to keep it fresh. One admission about the review: C0-owner Jeff was not at the restaurant and his partner had a really bad day trying to get the sous-vide machine up to speed which has adversely affected this review. The sous-vide burger was overcooked. There is no other way to put it lightly. The burger had a great crust on it so I have a feeling it could have been left on the grill a bit too long. It’s quite disappointing as the onion confit, rocket and sriracha mayo were a great complement to the burger. In typical Nyam fashion, we ordered way too much food and ordered 2 more sandwiches on the menu. Pretty much all of the food on the Garage menu is under $5 which makes it a great deal for what you get. I will definitely be back to the Garage to retry the burger as this was a one-off experience. Now onto a more different bear in Deco. 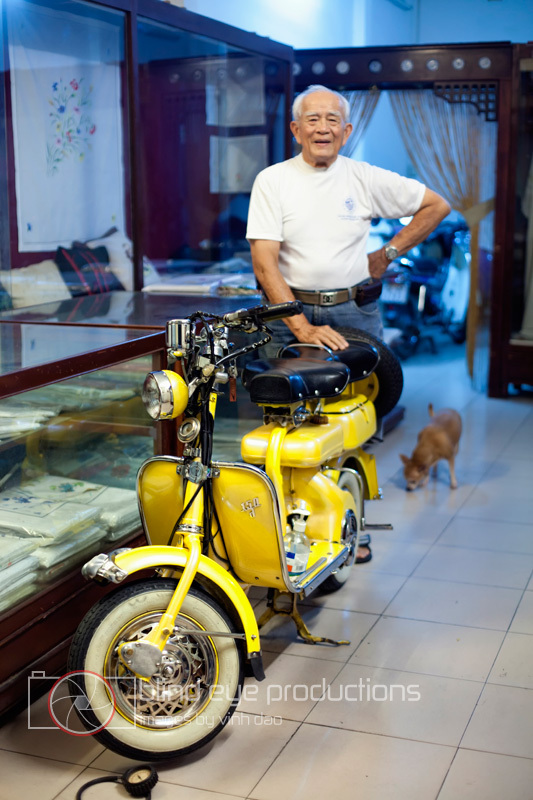 Co-owned by Caspar from Yumi and Rob from Rubies, Deco is located in BKK I and is set in a beautiful art-deco villa. The Deco burger is the best burger in town. However, it’s too much of a good thing. There are elements of molecular gastronomy on the menu but none of that exemplifies it more than the chilled tomato soup. 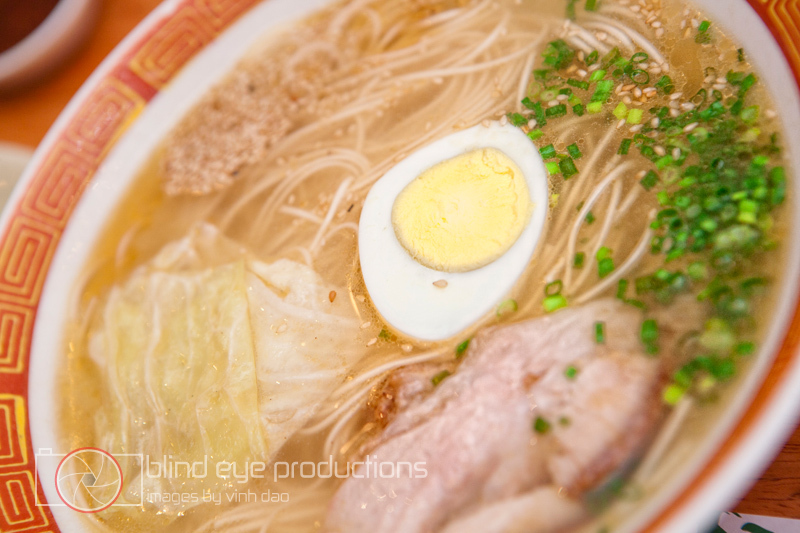 The clear broth belies the intense tomato flavor that pummels the perception of what your eyes are telling you. A great start to the meal. 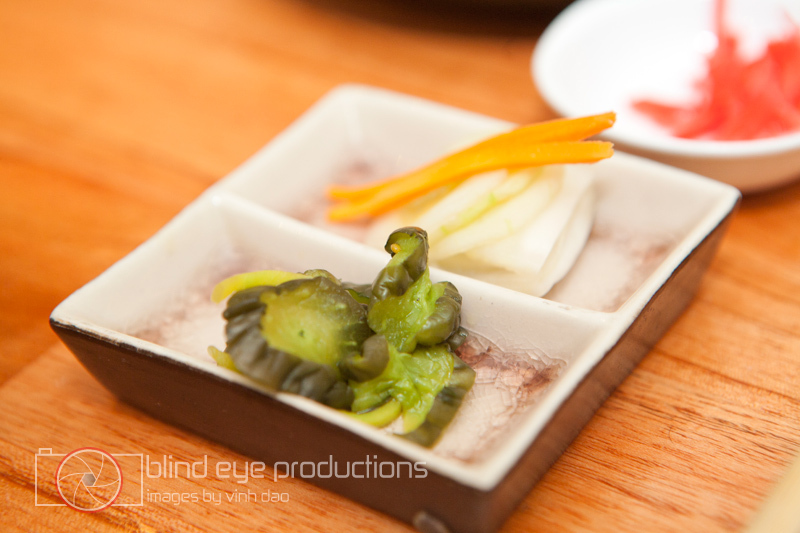 But throughout the meal, something was constantly nagging at me and it took me a week or so to figure out what it was. I have proclaimed the best burger in town a couple of times, here and here but both burgers had their faults. This one is completely flawless and that’s the problem with it. Maybe I like imperfection. Also, the location is too close for comfort. 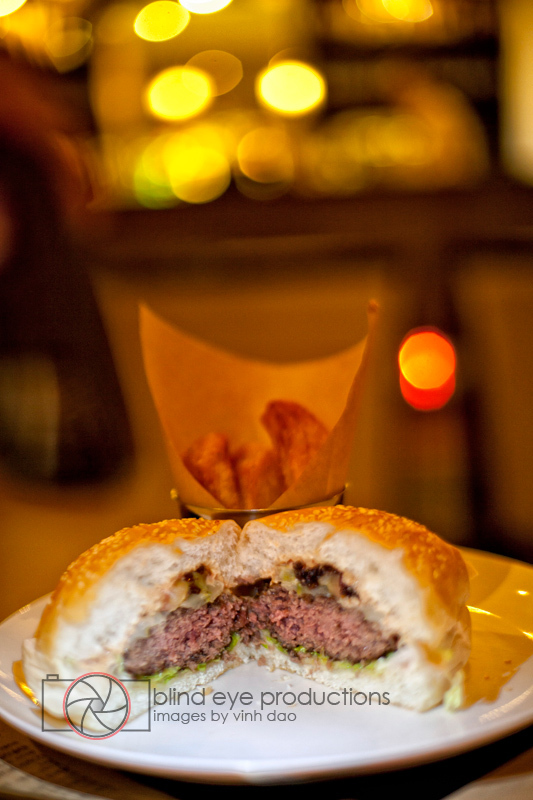 For example, I love the burgers at Cafe De La Paix (RIP). But one of the reasons why I love them is that they were 6 hours away from Phnom Penh and it took a bit of effort to get one. And that made them special. I’m not saying Caspar and Rob shouldn’t pack up and move to Siem Reap but it’s too much of a good thing. 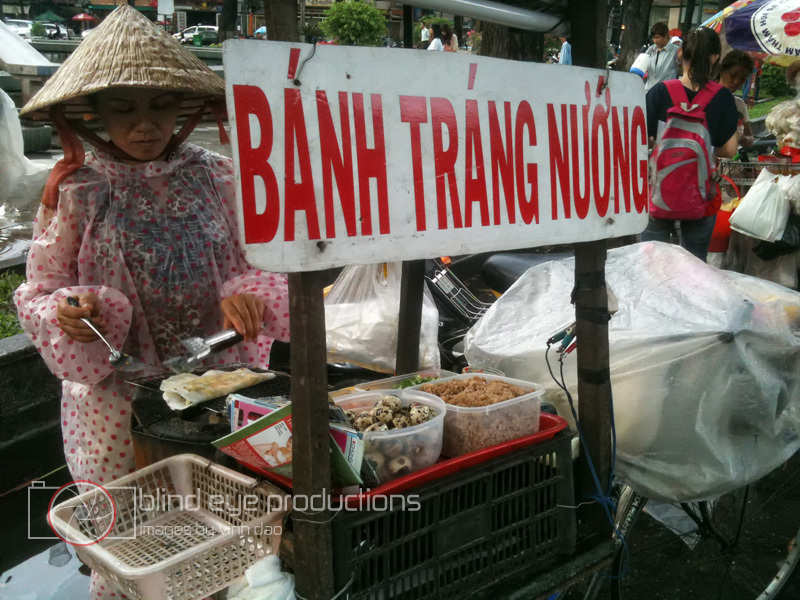 This is my last post as a regular contributor of Nyam Penh. 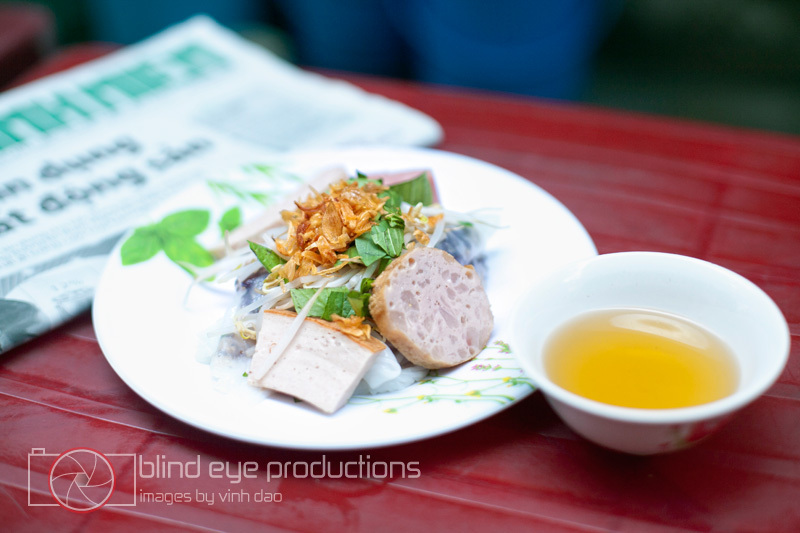 I have moved to Saigon and have started up a new food blog called Vietnomnom. I am getting content for a post in the next month so please check it out and let me know what you think of it. Also, thanks to all of our readers and commenters for reading Nyam Penh and helping us get to where we are now. 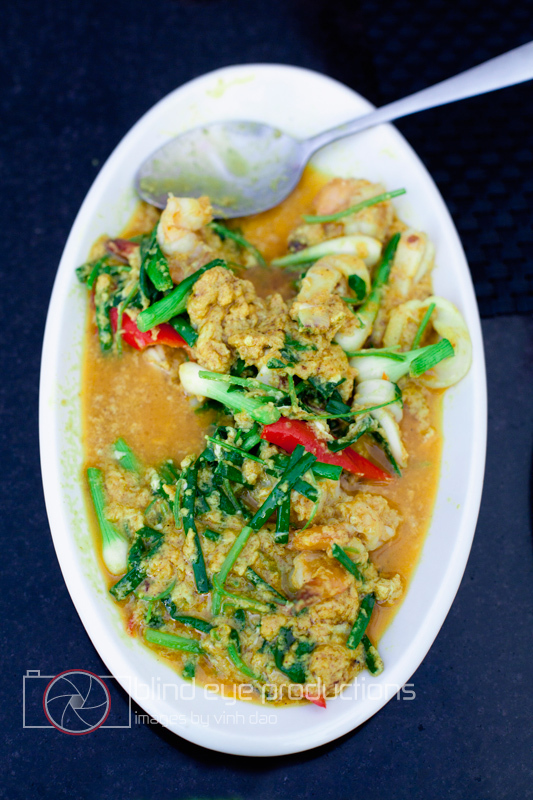 Ayotaya is a no frills Thai restaurant that is severely lacking on ambiance but inversely makes up for it in flavor. Upon walking in, you have a sense that you have entered a canteen. 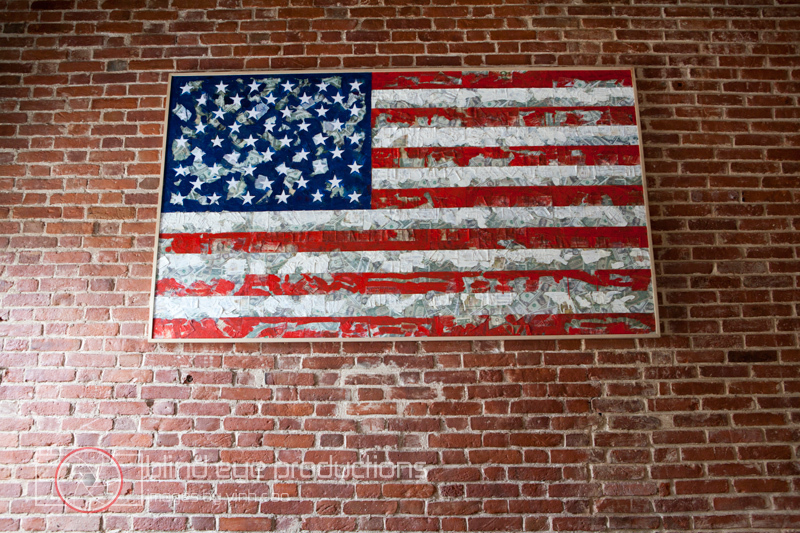 It’s white walls are bare with a few signs stating daily specials. It also has that living room look that only a canteen in Southeast Asia can have with a few couches in back, a whiteboard with daily specials which are in Thai no-less, and the ubiquitous TV running a very melodramatic dubbed soap opera. The good thing about places like this is the high probability of getting a really good meal. But sometimes you need a ringer to really order the goods. Enter Fon from Hungry Go Where who we gave the undue pleasure of ordering for us and Lina from My Big Fat Face. 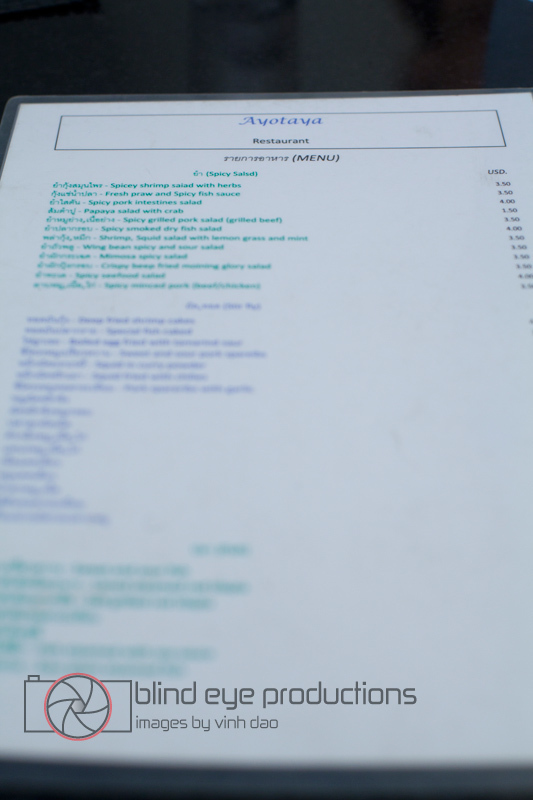 Fon ordered a total of 6 dishes which included 2 plates of Green Curry Fried Rice ($3.00), Lime Steamed Tilapia ($6.00), a Wing Bean Spicy and Sour Salad ($3.50), Fried Squid in Curry Powder ($4.00) and a side of fried eggs ($2.00). They were all excellent with the Wing Bean Salad and the Tilapia being my favorites of the meal. The salad was clean and fresh with the Wing Beans giving a great crunchy texture to it. 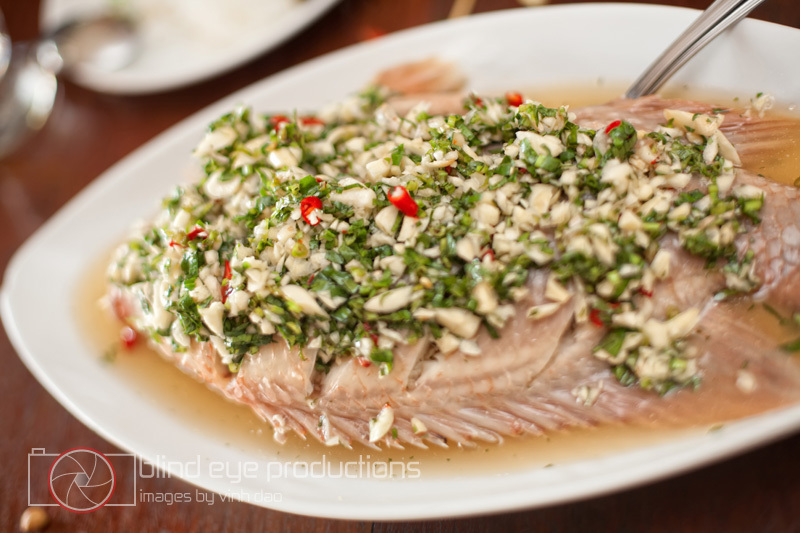 For the Tilapia, I am a huge fan of this Thai preparation and almost always order it when it is available. The only niggly thing I could say about the meal was the quartered hard-boiled egg as garnish on almost all of the dishes. All in all, Ayotaya is a great Thai restaurant on the cheap if you can deal with the canteen-like feel of the place. Ayotaya is conveniently situated at st 302 in BKK1. You wont miss the cheerful yellow sign outside Decoration is basic, yet clean and welcoming. 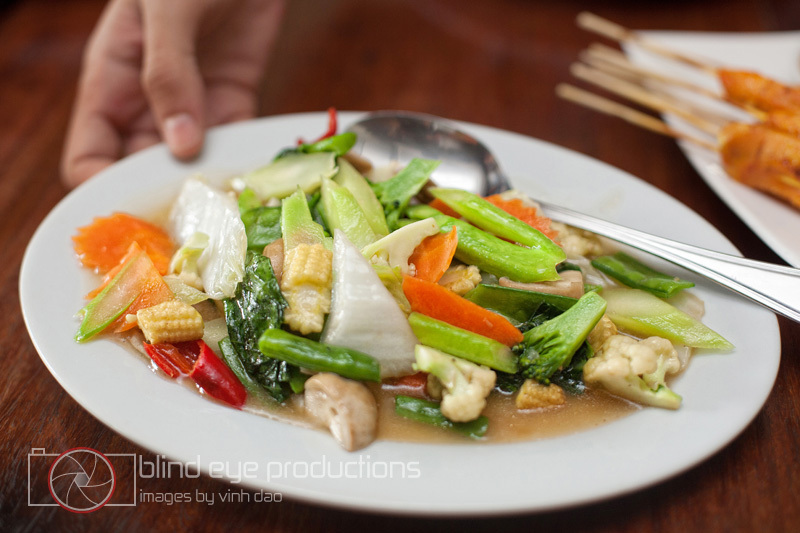 Being Thai, of course I was tasked to order for the other 3 foodies – pressure was on. Fortunately all the dishes we had lived up to the expectation. I was happily to collect the compliments! 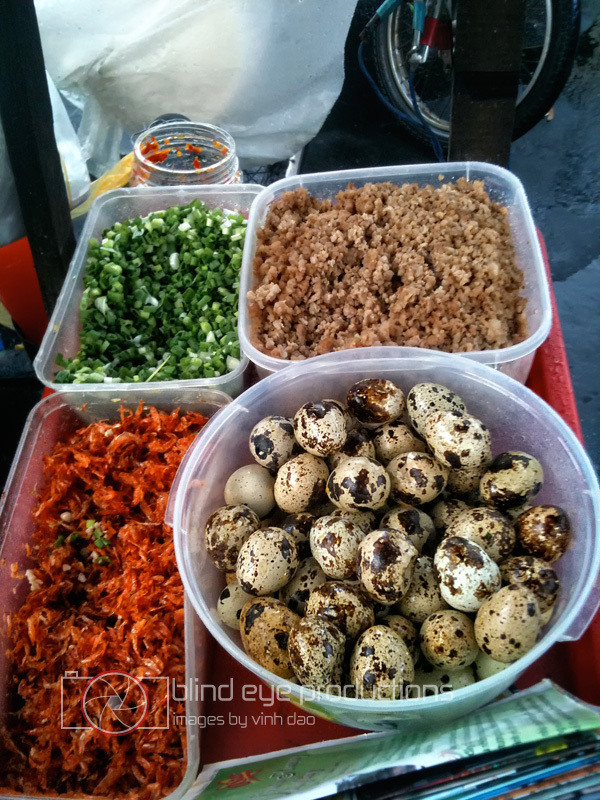 We ordered few things to share; snake beans salad with prawns, steamed river fish with garlic, chillies sauce, green curry chicken fried rice and fried eggs to accompany the curry fried rice. 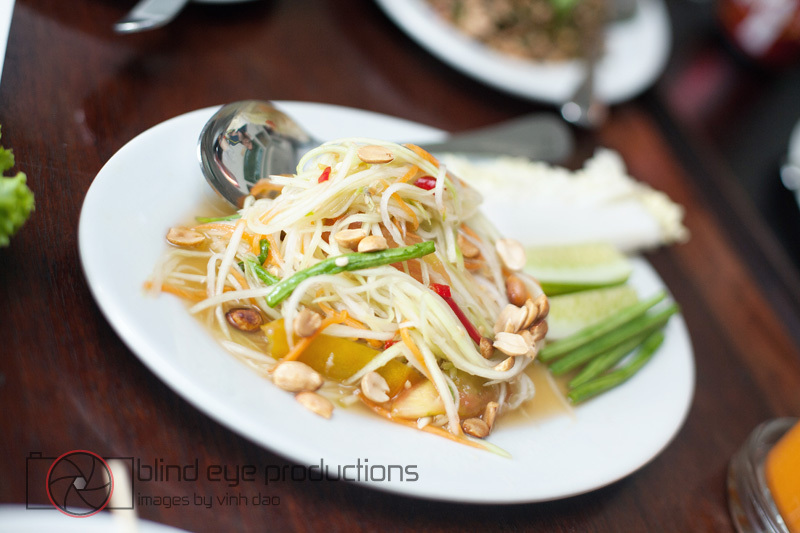 Snake beans salad with prawn came with light and slightly spiced coconut dressing. It was a hands down everyone’s favourite and personally, I can eat that everyday. Steamed river fish came in a generous portion. We asked for the garlic & chillies sauce to be spicy and the restaurant was not shy to give us that. 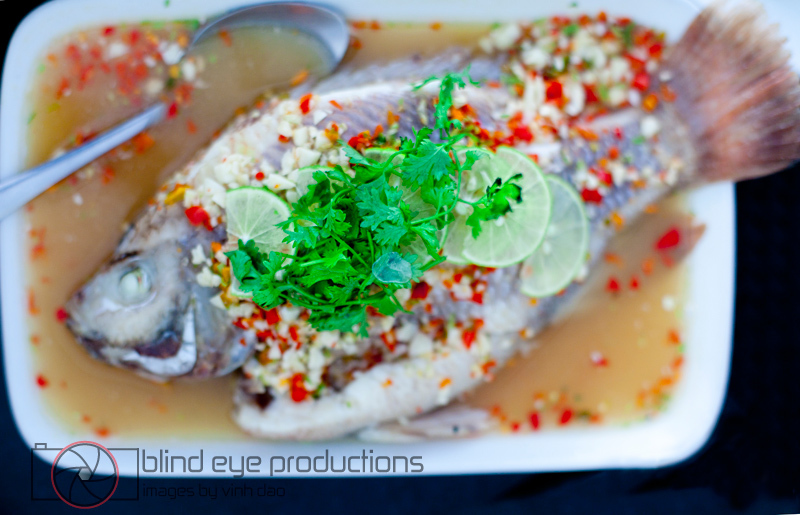 The sauce offers that perfect sour, spicy and salty combination which compliments the fish really well. We just could not have enough of that. 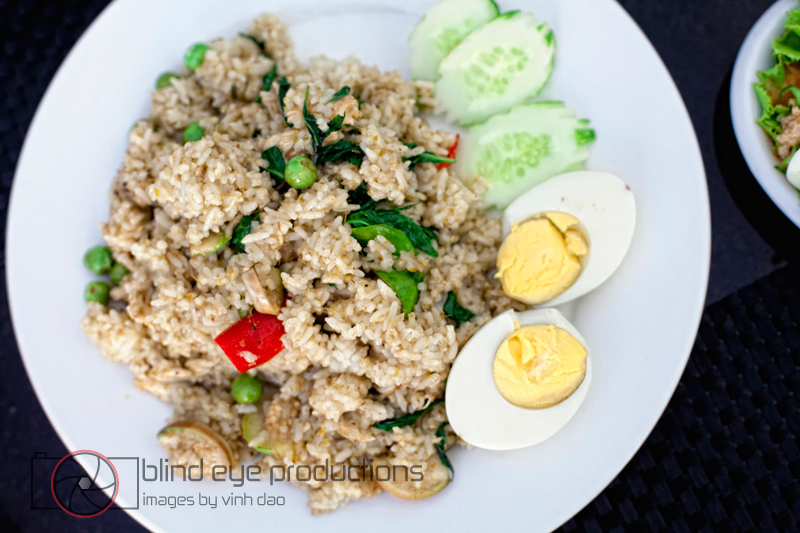 Last dish, curry fried rice with fried eggs. 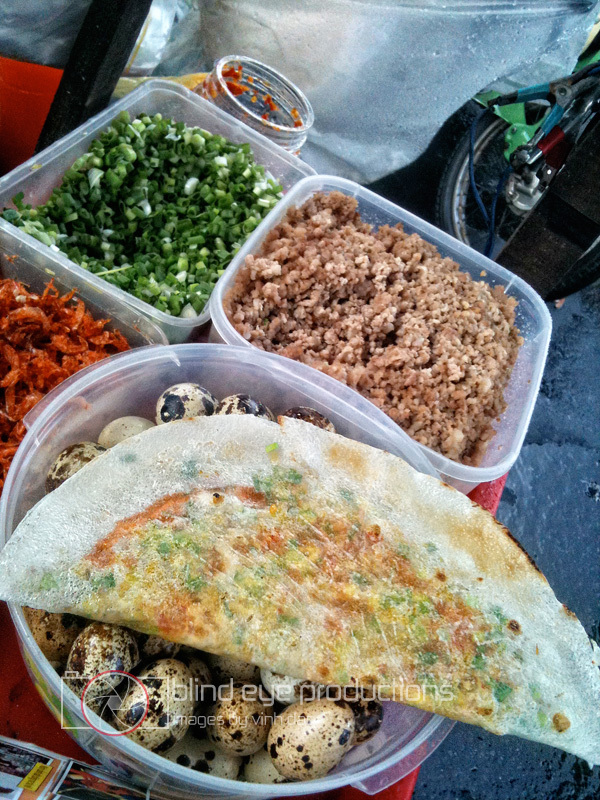 The dish reminds me of good street food in Bangkok – rustic and giving home cook feel – Two thumbs up! There are daily specials on their board every day (in Thai). 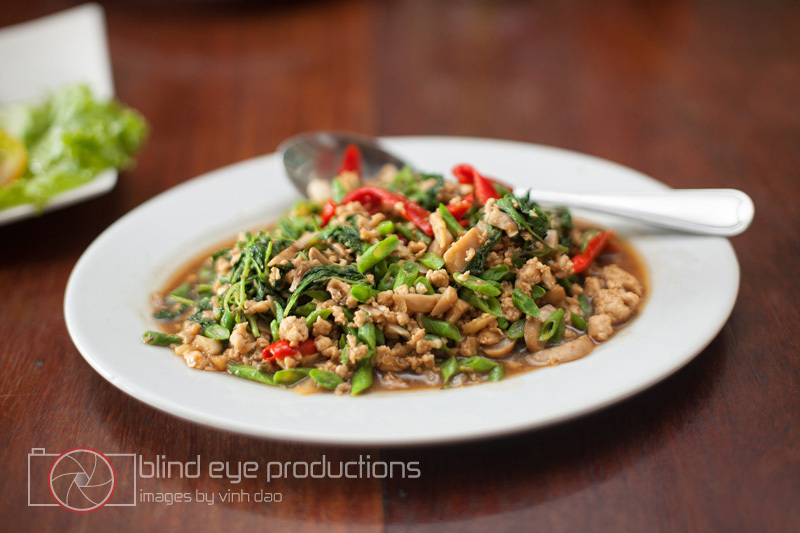 Just ask what they are if you are curious and want to try something different, their Thai staff will be able to explain to you. 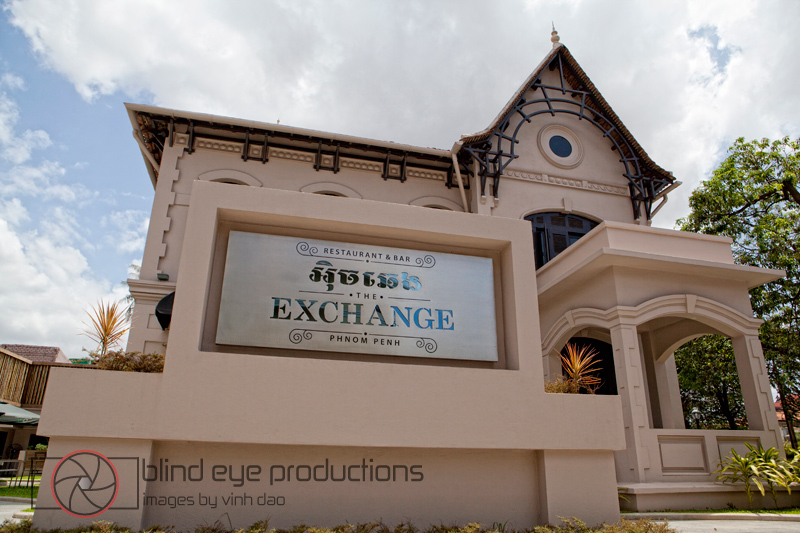 The Exchange is one of a number of high-end restaurants that have opened up in Phnom Penh in the past 6 months. I tend to wait a bit to let the restaurant get on it’s feet a bit and sort out the niggly details that comes with opening a restaurant. After hearing that Al formerly of Sharky’s was running the food side of things, I excitedly threw out this rule and showed up on opening day. Unfortunately, in my excited state, I forgot to bring my camera. The interior of the Exchange exudes class and was very well designed. Also, I really enjoyed the open air feel of the place with lots of windows let in the breeze and light. I ordered the burger and my wife ordered the braised lamb shank. 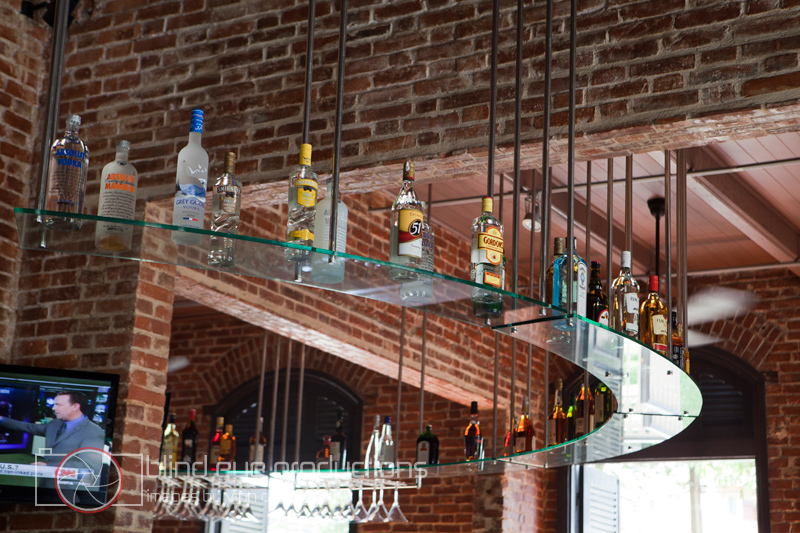 Both were excellent and the service was impeccable. The only issue was my burger was dripping with juices which made it nice and juicy but turned it into a soppy mess. Al came over after our meal and I mentioned the juiciness. He winced and mentioned that the staff isn’t properly resting the burger before serving. I didn’t think anything of it as it was the first day. Fast forward to a week ago where Bryse and I headed back to the Exchange to have one item and one item only: the cheeseburger. It’s advertised as the Flame-Grilled Black Angus Beef Burger on the menu and was definitely worth it a second time around. The menu is a mix of pan-asian and western grilled plates and prices range from 8.00 to 16.00 dollars but we didn’t bother with anything else. 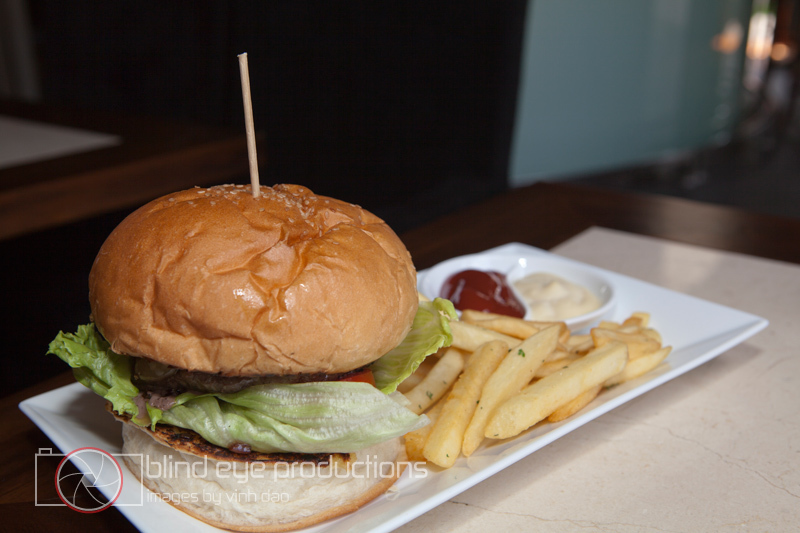 Perfectly cooked to a rare temperature, the burger comes with extremely fresh tomatoes, crispy lettuce, an onion confit and swiss cheese on a not-too sweet sesame seed bun. A side of fries with a garlic aioli and ketchup round out the plate. Not too bad for $7.50. I mentioned in an previous post that T-Bone had the best burger in town but after this one, I have to take that crown off T-Bone and place it squarely on the Exchange burger. 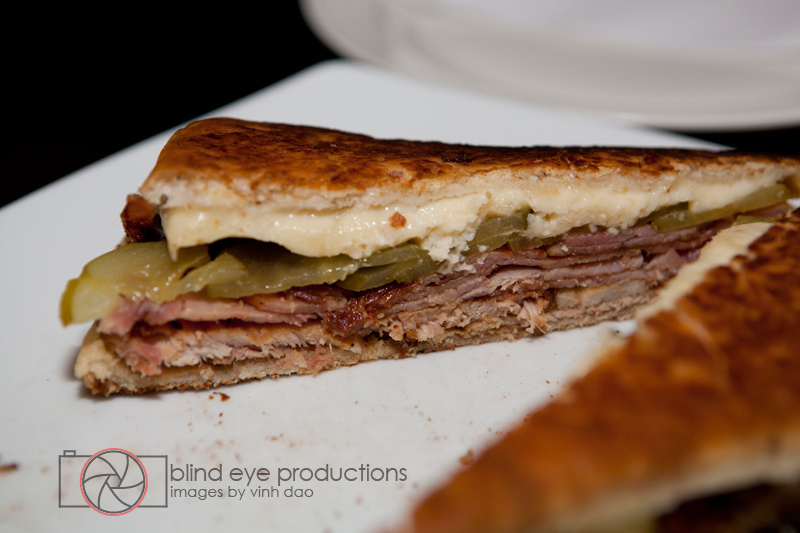 The high quality of the imported Australian meat shines through and the fresh garnishes make it the complete package. So next time you are fixing for a burger and are willing to dish out a little more loi, then you can’t go wrong with the burger at the Exchange. During our research for the Fast Food Burger extravaganza, Bryse and I searched high and low for fast hamburger places to try in Phnom Penh. In our research for a burger cart for the review (which failed miserably I must add) , I found out a take-away chicken stall that has been a great go to for cheap and delicious eats. 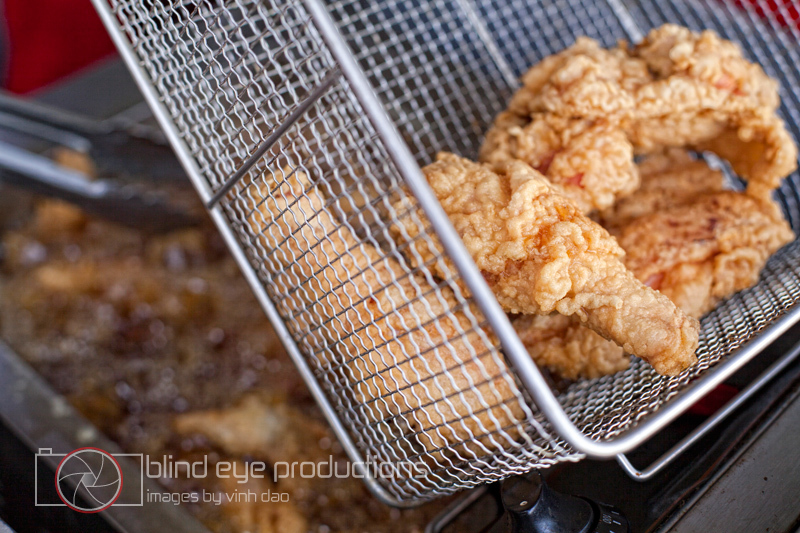 Enter the CP Fried Chicken cart. 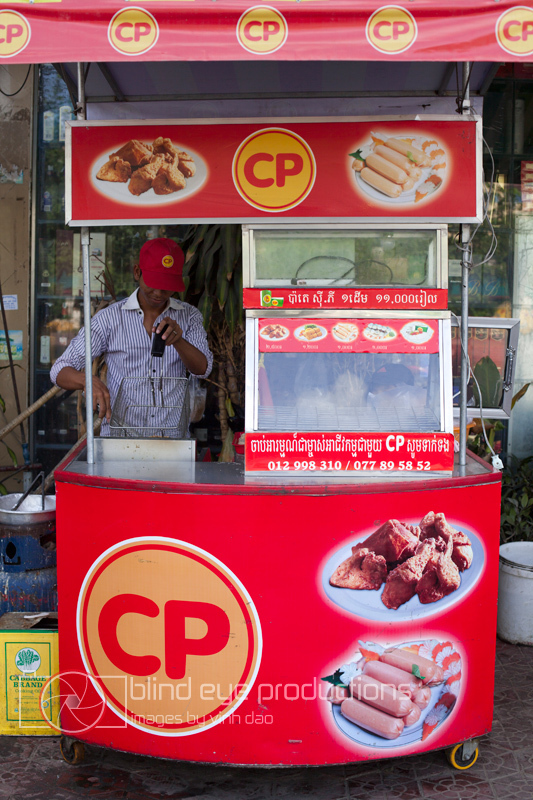 Contract farmed in Kompong Speu for the CP Company, the chicken is brought to Phnom Penh and made into deep fried goodness. 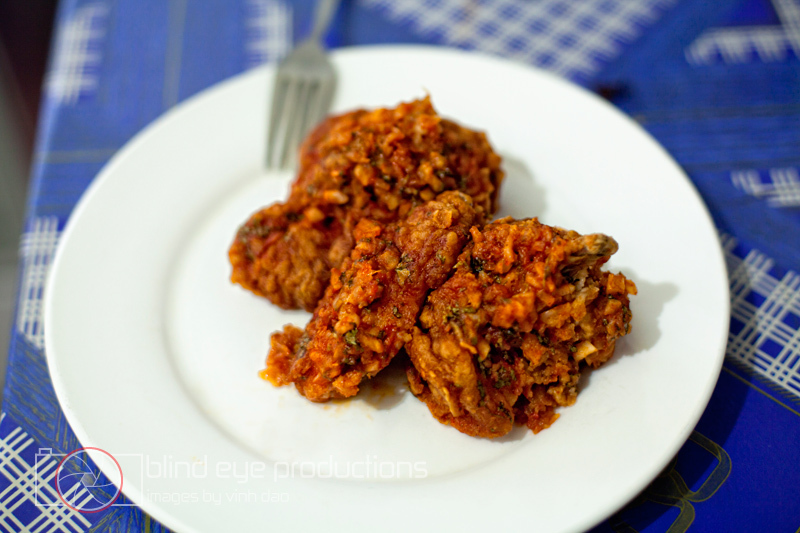 I have never seen breasts there but since I am a huge fan of the wings and thighs, it hasn’t bothered me too much. And I have to admit, I am a bit addicted. Only 2,500 Riel a piece, the chicken is very tasty but definitely geared towards the khmer palate as the breading is a bit sweet but if you can compensate for that, it makes for a fantastic meal. Which brings me to the At Home part of this posting. 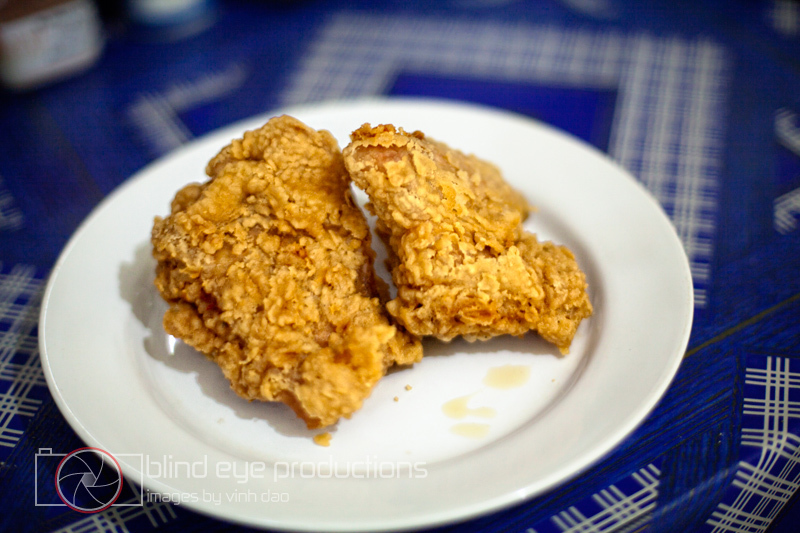 When you get the chicken, it comes with some napkins and the typically sweet chili sauce that is ubiquitous to the region. The sauce ups the sweetness factor to 11 so I tend to throw it away the packet. Upon getting home with my chicken, I usually open up my fridge and check it out to see if I can scrounge up any proper condiments with the chicken. 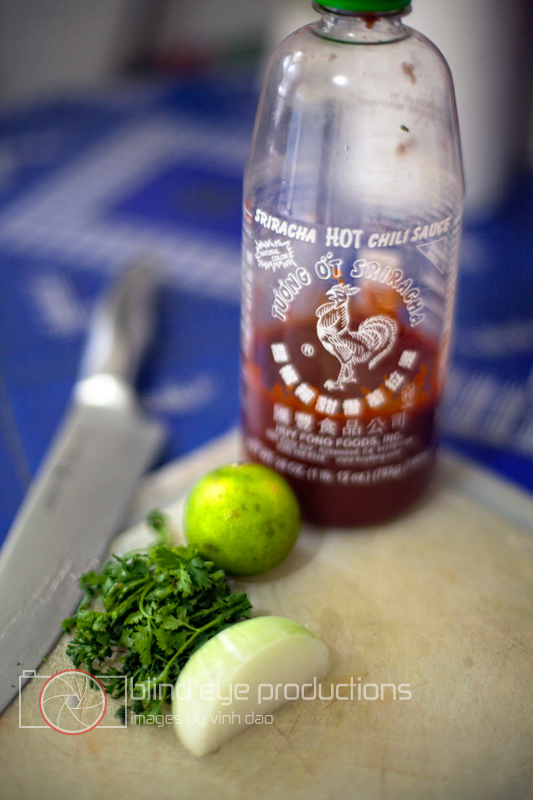 This time, I went to my trusty Sriracha sauce and decided to whip up a variation of a great glaze I found online. I purposely left out the honey in the recipe due to the already sweet breading and added half a diced onion for a bit of texture. After pre-heating the oven to 250 C, I combined all the glaze ingredients and tossed the chicken in them. 20 minutes in the oven allowed the breading to crisp back up and what came out was crispy chicken that was spicy, tangy and easy on the wallet! You can find the CP carts around town but my main haunts are the ones on Sothearos. The first is in front of the VIP Mart around the corner from the White Building and the other is just south of the old National Assembly. 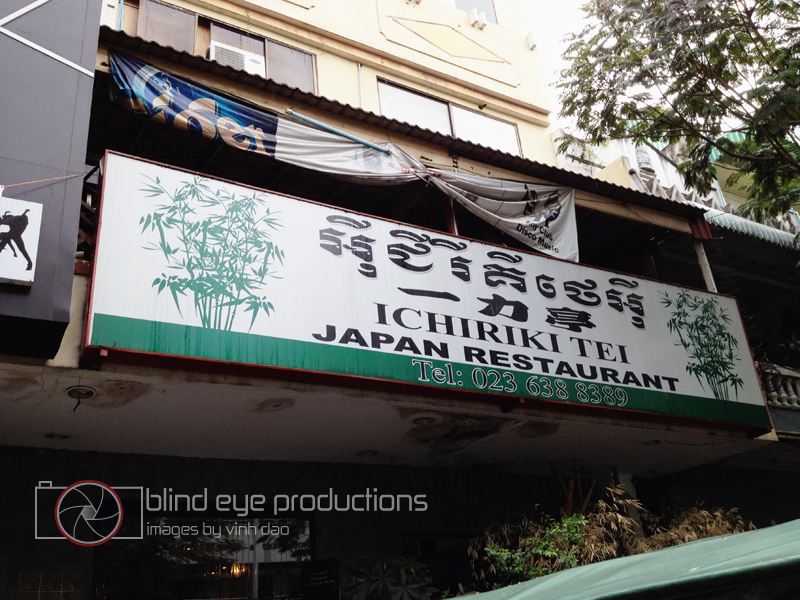 Located on Kampuchea Krom just west of Central Market, Ichiriki Tei is a great Japanese restaurant that not only serves your generic sushi and nigiri rolls but some seriously filling homestyle cooking. We were greeted immediately by the staff and were offered a huge table that could have easily fit 10. 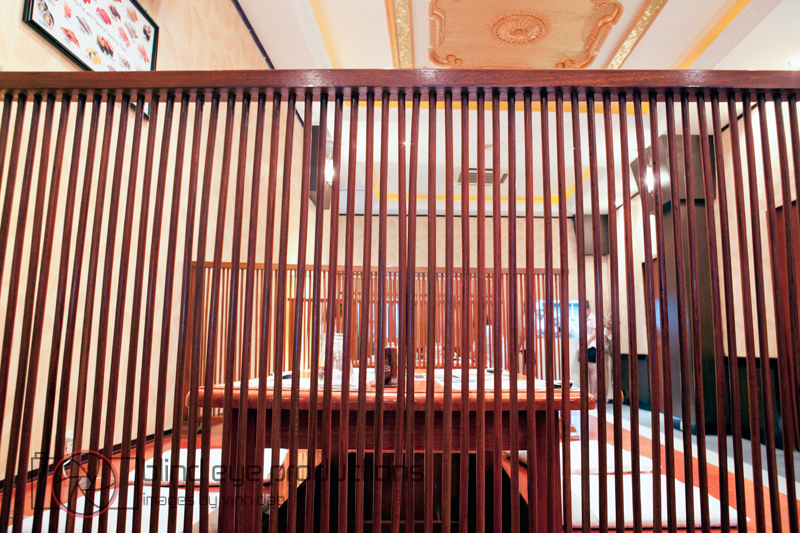 The interior is a blend of tacky Khmer Riche and understated Japanese. 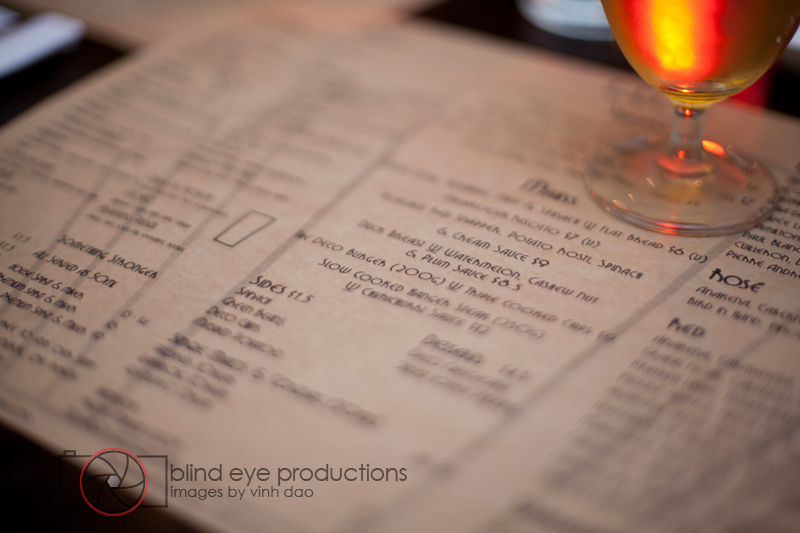 The menu is quite extensive and was a bit daunting to look through. Luckily, the proprieter was very patient with us newbies and guided us through the menu. Between the 3 of us, we ordered 4 dishes. 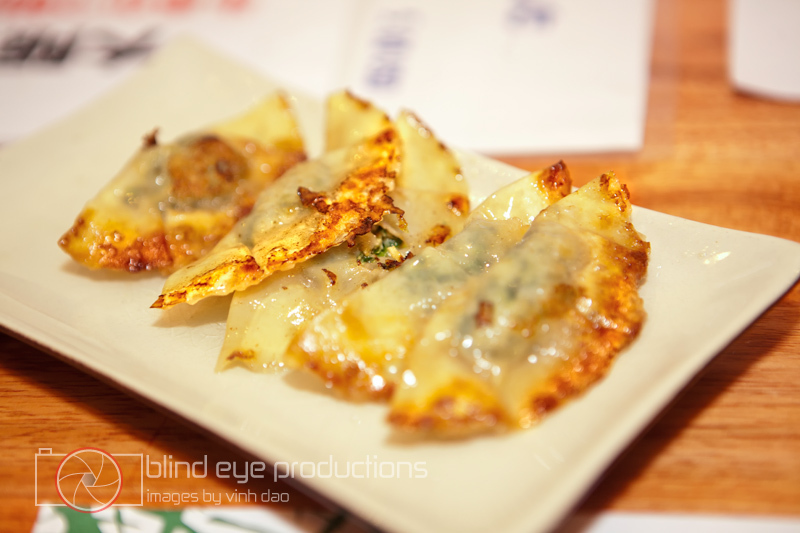 The first dish that arrived was the gyoza. At $2.00 for 5 pieces, it was a little expensive, though not as expensive as the gyoza at Bekkan Ramen. 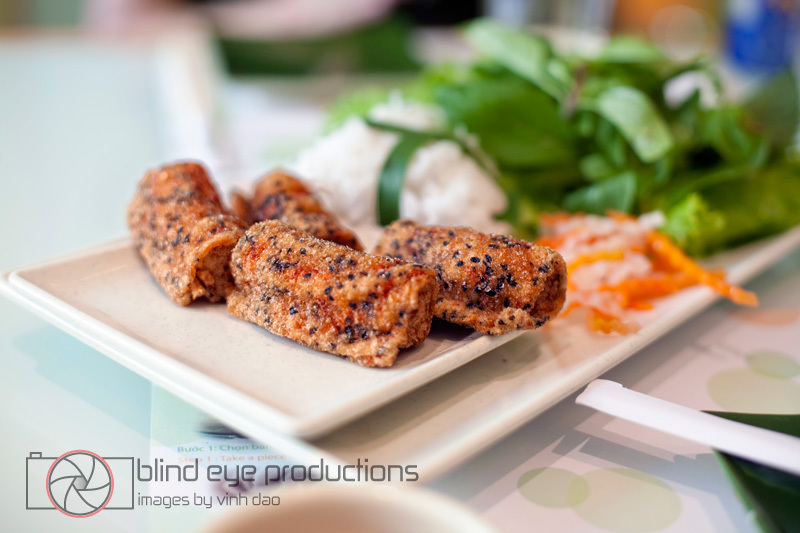 I felt they were a bit bland and definitely needed to be dipped in the accompanied soy sauce. After the demolishing the gyoza, the rest of the plates started to appear. Ichirikitei Special Ramen ($6.50) was one of the lunch specials of the day. 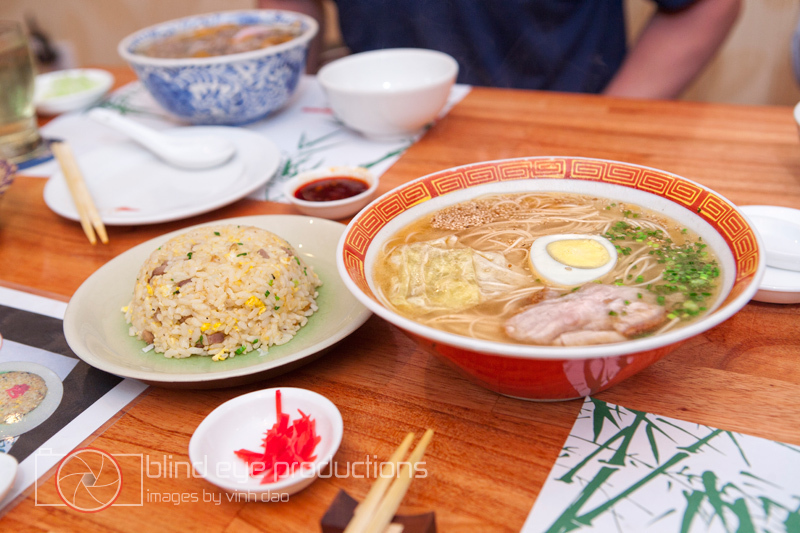 Along with the noodle soup, you get a pretty generic plate of fried rice. . I would suggest sharing your meal if you want to actually do anything after your meal. 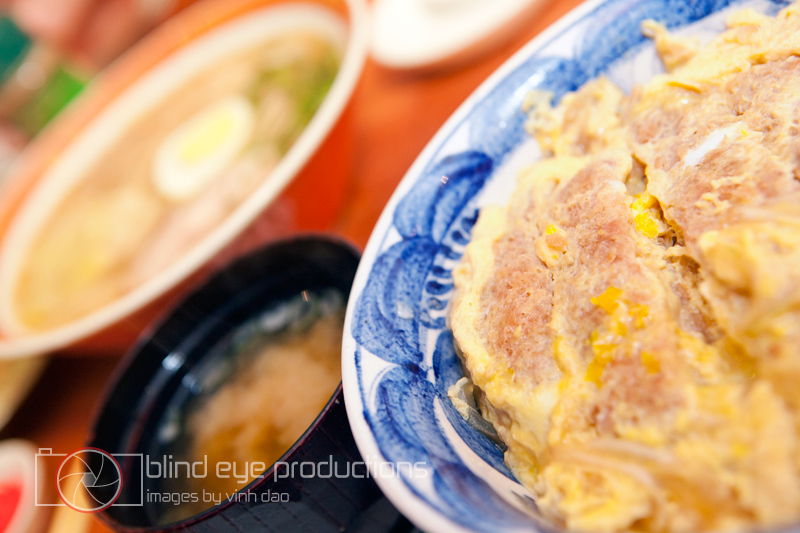 Half a boiled egg, sliced pork and cabbage accompanied the thin round noodles that came in the sesame oil-infused broth. The next dish they plopped down was the Katsu Don ($8.50). When I say plopped, I mean a thud. The bowl was huge! 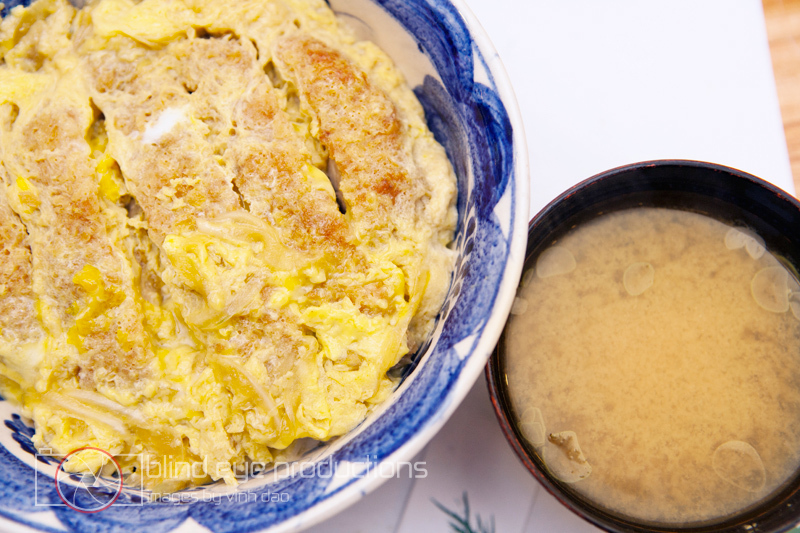 The deep-fried pork cutlet was smothered with a beaten egg before serving and tempered the crunchy breaded pork that is usually served with this dish. 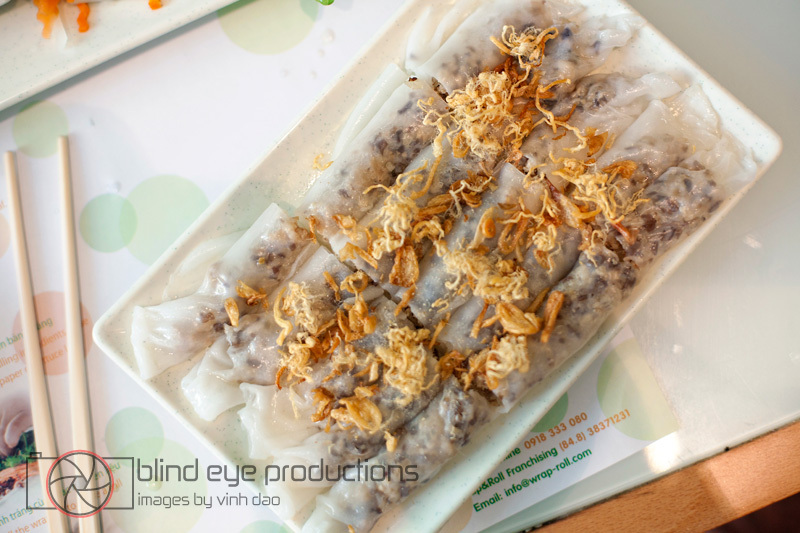 The rice was flavored with a bit of soy sauce and was a nice counter-punch to the rich pork. A definite gut buster! The Niku Soba ($7.00) was the last bowl to come out. 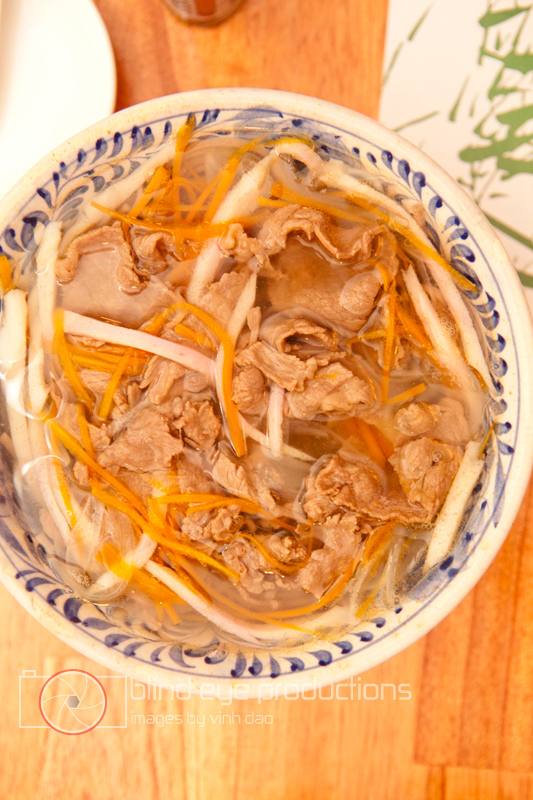 Nice and chewy soba noodles were served with sliced beef, carrots, onion. 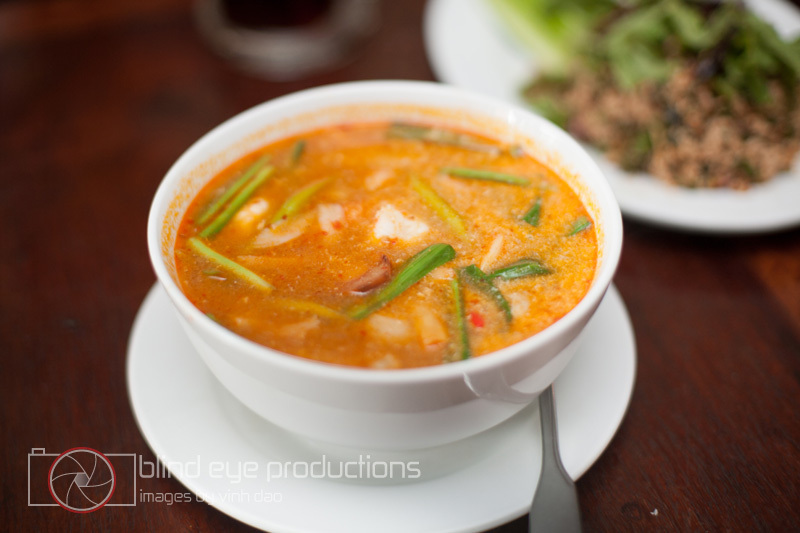 I found it to be a bit bland and once some heat was added to it via some chili flakes, it made for a pretty good broth. All in all, a great place for those who are looking for homestyle Japanese food and don’t mind not doing anything afterwards. 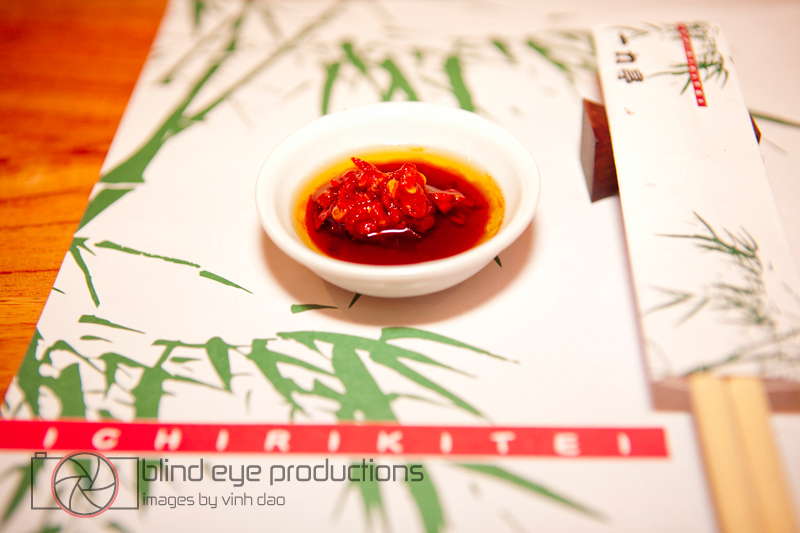 Once we were able to find the front door at Ichiriki Tei and found our table, the overly attentive staff started piling hot towels, menus and sauces on our table. The woman that spoke the most English explained to us that the chunky chili sauce they brought over was homemade so we had to give it a try. We mixed some in with the soy sauce and it was decent, not too spicy and a bit sweet but the mix went well with the gyoza. My eyes bugged out when the Katsu Don arrived at the table. Probably really unhealthy but the katsu don consists of delicious tenkatsu and fried eggs piled on a top of really nice Japanese rice. This was by far my favorite dish (I’ve actually been back twice since and ordered this). The ramen was really cheap so I wasn’t expecting much but it wasn’t bad for the price. The noodles were not fresh but the broth and pork were really nice. The Niku Soba and fried rice were fine but not stand outs. 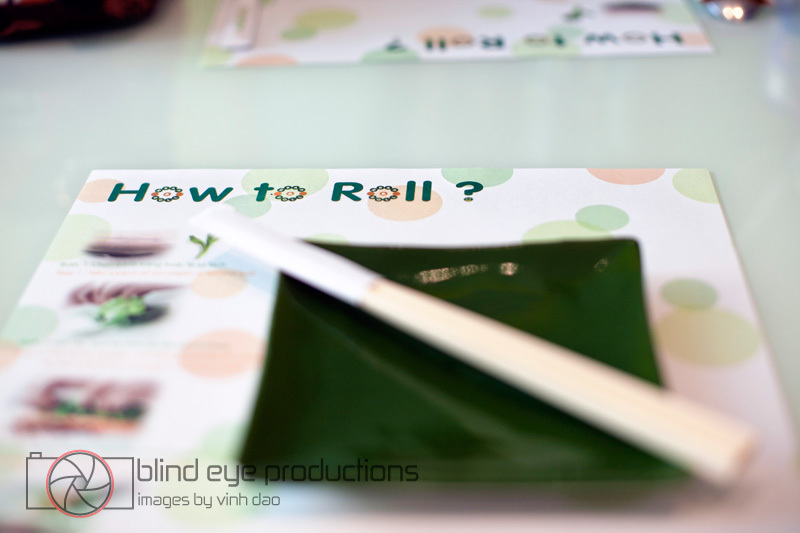 Americans typically associate Japanese food with healthy options like fresh sushi. This Japanese food is not healthy. Ichiriki Tei does have a very expensive sushi section but bulk of the menu is “Japanese soul food” which is definitely the reason to visit this place. 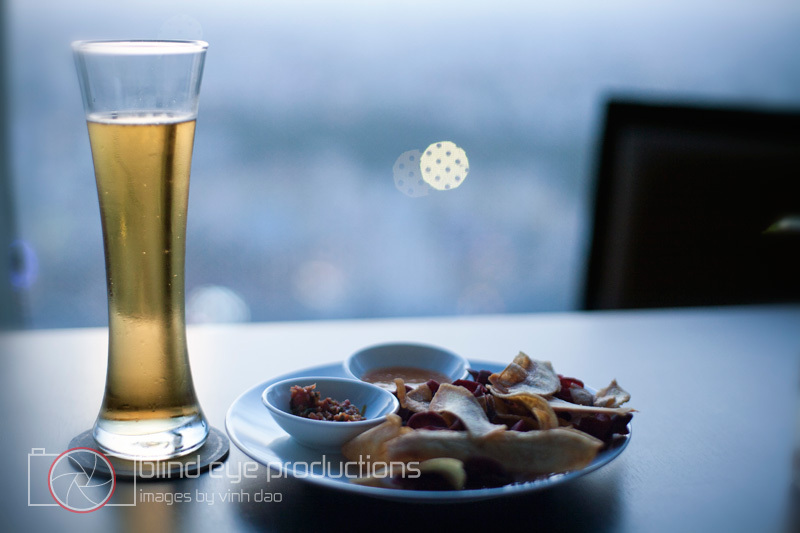 Phnom Penh’s Golden Street or Street 278 is known for it’s many bars, restaurants and shops. So many in fact, that it can be hard to choose a venue to dine in. 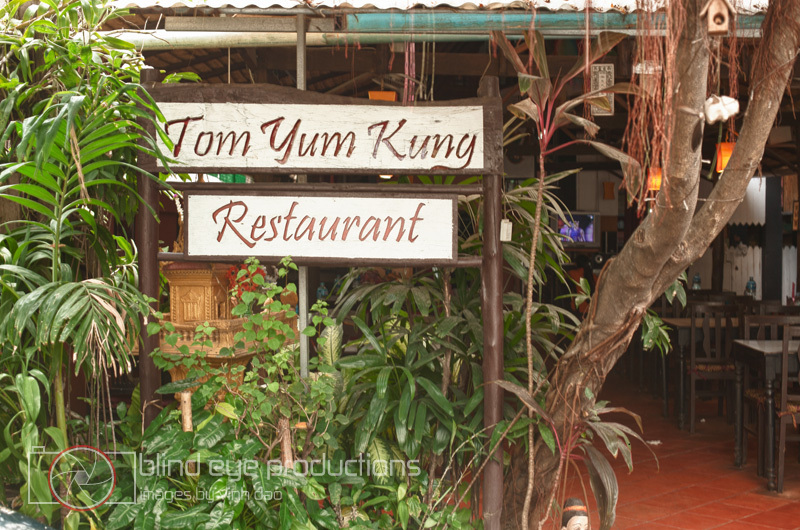 However, if you head just a bit west of Street 57, you can find a gem of a restaurant called Tom Yum Kung that dishes the goods. I have driven by this restaurant too many times to count and never knew it was there until it was recommended by a fellow Nyammer. I think this is due to the parking area which is at the entrance of the restaurant and if there are a couple cars there (which there usually are), the sign is covered up. 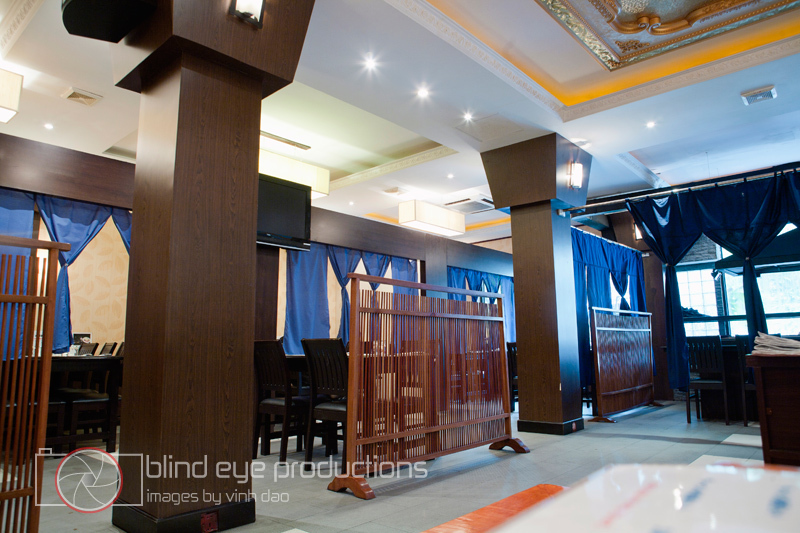 Either way, I am glad I found it because it serves some of the best Thai food I have had in Phnom Penh. I went with a pretty large group of people so we were able to order a ton of items off the menu. Probably the best dish we ordered would be the first one we received. 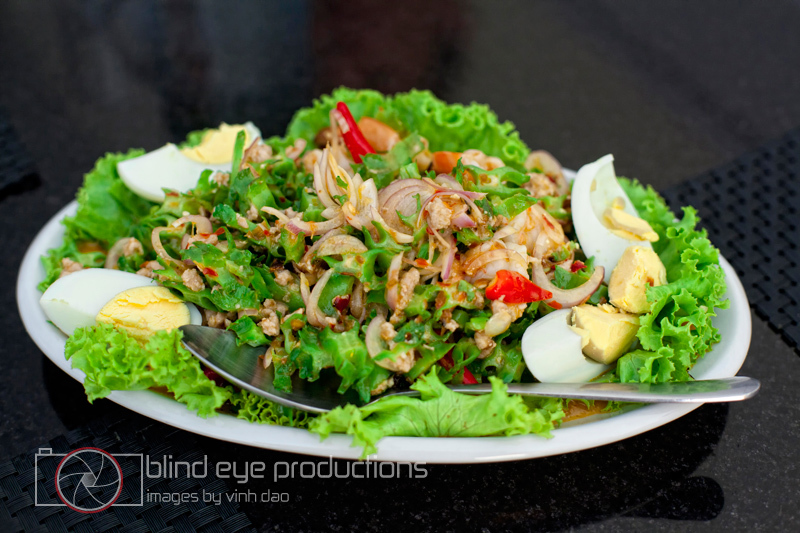 The quintessentially thai salad Som Tam ($1.50). 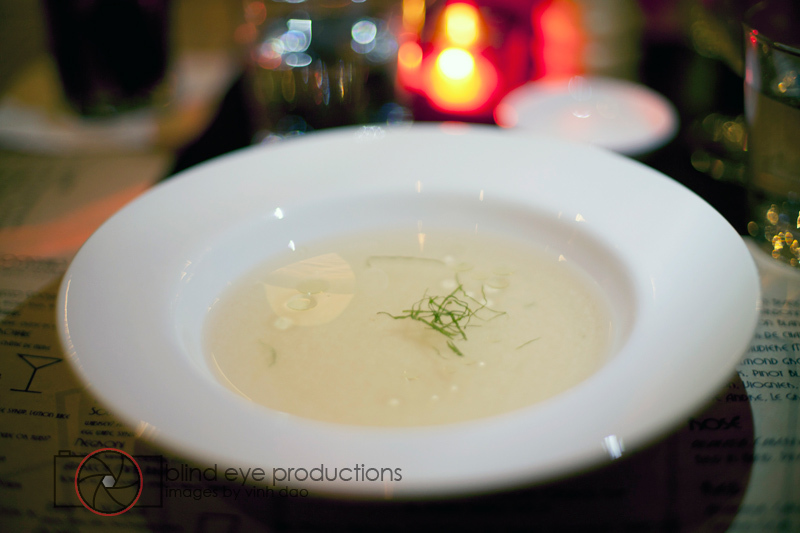 A great start to the meal, it had just enough heat to kickstart our palates for the upcoming feast. 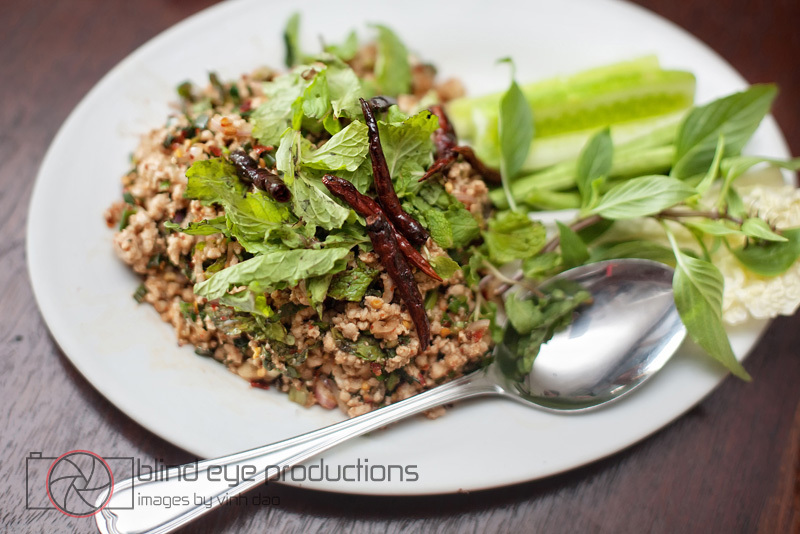 Add some sticky rice to this and it makes for a meal in itself (which I have done twice since). 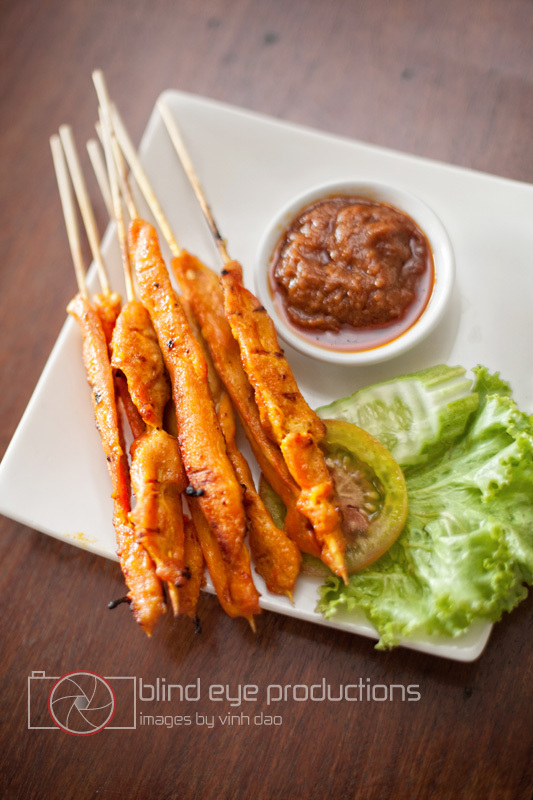 We also received some Satey Khai ($3.00) the same time we got the Som Tam and the skewers of chicken were so good that they only lasted a minute on the plate. So we ordered another. After dusting off the two starters, the dishes started pouring onto our table. Check out all that fish!! We ordered everything spicy but I have to give the restaurant some credit for not destroying our taste buds by overpowering the tastes of the dishes with copious amounts of chili. That’s not to say that there wasn’t any heat, they just knew the right amount to put in. 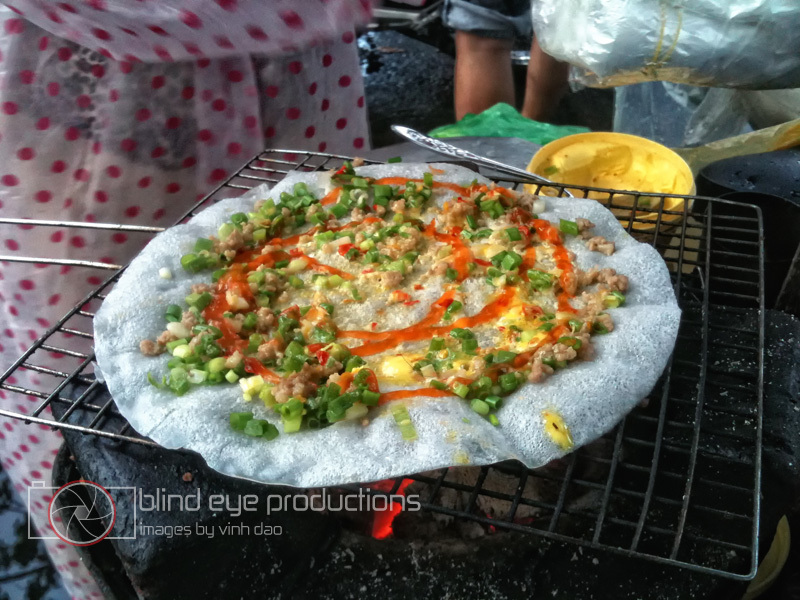 All of our group absolutely loved the Phat Kaprao Gai with it’s simple, fresh flavors and Pork Laarb didn’t last too long before being demolished and put out to pasture. 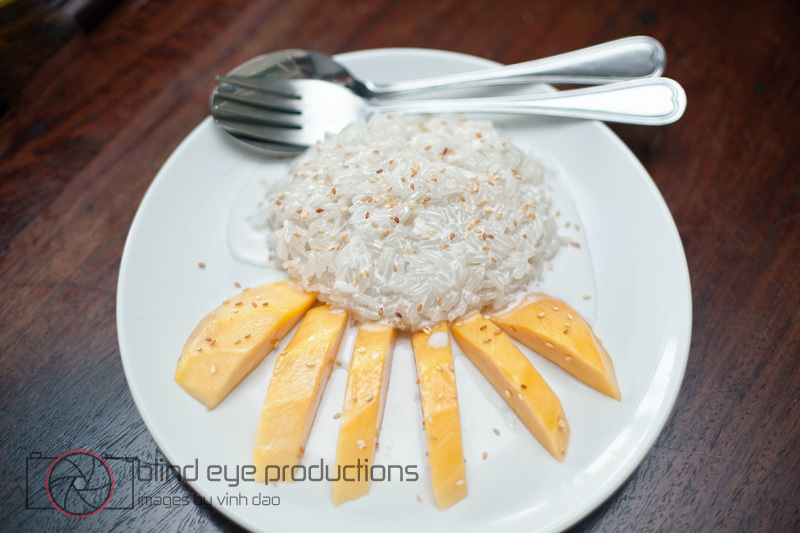 After stuffing ourselves silly, we lived up to our nyamming reputation and ordered some Khao Niaow Ma Muang (Mango and Sticky Rice $2.75) to finish out the meal. A great end to a fantastic meal.